Once only a staple of Mr. Rogers and our grandfathers, the cardigan has returned in recent years to a seasonal staple for guys of all ages. If you don't have one yet, let us push you in the right direction. 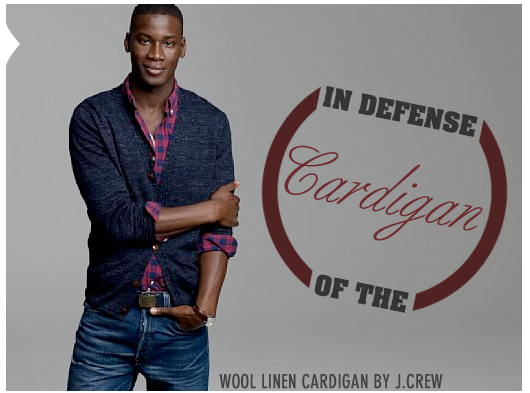 The cardigan has gotten a bad rap as of late: it has been relegated to a certain feminized subculture and taken away from sartorial traditionalists who used to know it as a comfortable, adaptable piece of the wardrobe. This cloud is not without its silver lining, however. Whereas in the past the cardigan would have only been worn at times when you were not expecting to see other members of civilized society, it has become an acceptable presence in virtually any surrounding (at least here in Los Angeles). The fact remains, however, that the cardigan has done an about-face in the past five years. It is now worn “ironically” and the fact that it used to be the standard go-to clothing for the elderly has been used to bolster these claims. It’s a tough spot for a piece of clothing with so much provenance to be put into, and there is a tremendous amount of pressure on a garment to live between these worlds. There is an alternative – but to locate it we must look to a time when it was not considered either too old or too ostentatiously hip, but simply what it was meant to be: a useful, versatile and timeless piece. When I think of cardigans, it’s tough for my mind not to wander to the Urban Outfitters set, but I would be remiss to do so. When I really think of how one should be worn, I look back toward the mid-century of Hollywood, when the style icons of the day melded comfort with high-style with unapologetic grace. 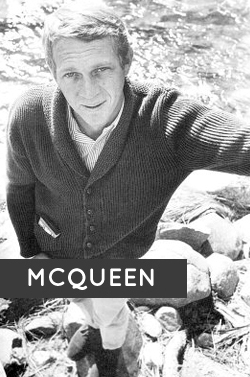 I think of Steve McQueen in a shawl-collared ribbed number from 1962 (featured in an excellent photo retrospective about the actor’s life) who made his cardigan not an item meant to be joked about, but a statement – he was to be comfortable, stylish and somewhat rakish. Sure, many may argue that someone of McQueen’s stature would be able to wear virtually anything and make it dapper, but I would argue that much of his ability to foster this image was simply based around his confidence with which he selected clothing. 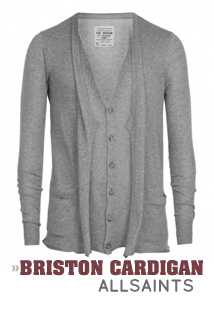 I, for one, rely on the cardigan as a staple of my closet. I have a variety of styles and fabrics to choose from and each fits a niche in my outfit selection. Today I’m wearing a simple charcoal t-shirt cardigan; it gives me the ability to work with tremendous comfort, provides a couple of extra pockets (something that only a jacket normally would afford me) and, given that I’m not seeing any clients today, makes me appear as though my outfit consists of more than just a t-shirt and jeans. When it gets colder I’ll break out my heavier cable knits with a button-down oxford. When I’m feeling more formal, I’ll wear one under a jacket and over a shirt and tie. It gives me the perfect balance between a sport coat and a sweatshirt, and I’m all but positive that I’ll get more compliments about it than I would about either the other two options. 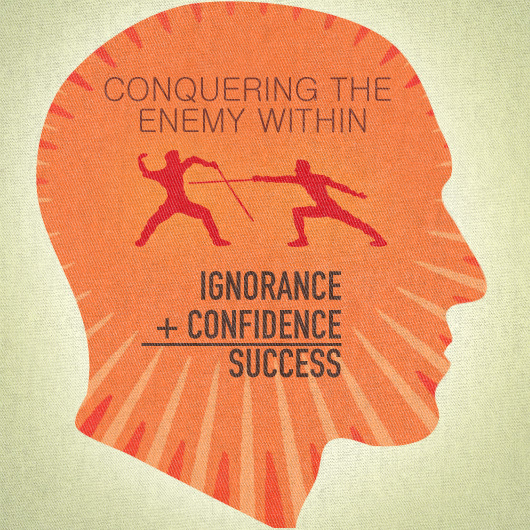 It is undeniable though that it is the outer layer of choice for so many with whom we believe follow trends too blindly. Wherever you may come from, and whomever you may surround yourself with, there is always going to be a nagging suspicion that perhaps the cardigan is a touch too modern-day beatnik, a little too glasses-with-clear-plastic-lenses for your tastes. To this I say there will always be a group who is able to claim your favorite clothing: from Red Wing boots to bowties, the modern world is constantly in the midst of a territorial dispute over all but the most uninteresting of dress. So, gentleman, it’s time to take it back. There is absolutely no reason that the cardigan should be relegated to any certain social group, least those that wear it with a winking inauthenticity (credit to Mr. Lorentzen of Time Out). This has been a staple of a man’s wardrobe for decades (I would confidently say centuries, but without proper citation I simply cannot) and has served us well for this long. 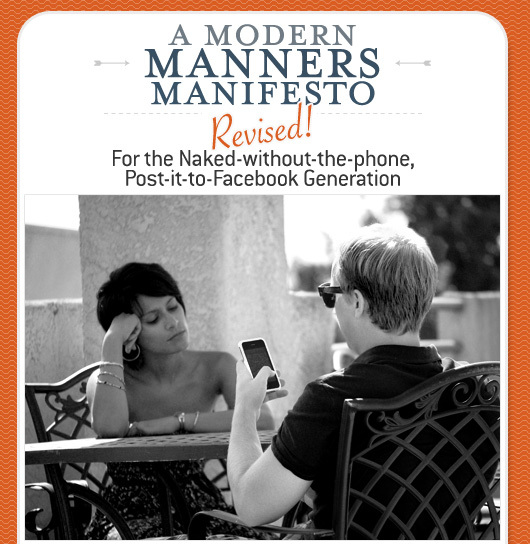 Despite our well-intentioned desires to return to a mindlessly-overdressed era, we live in relatively casual times. Blame it on the recession, blame it on our generation, but either way we need to accept that there is a time and a place for suit and tie, and this place is most likely not your favorite dive bar. Luckily, there is a middle ground in the cardigan. It’s not going to be easy – plenty of trips to the store without purchase – but so long as you select intriguing fabrics, well-suited densities and pieces that genuinely (and you have to be very, very honest with yourself here) fit properly, you can reach it. Will Cassayd-Smith grew up in the Midwest and now lives in Los Angeles. By day he works in advertising and in his off hours he ponders how to approach hedonism in a socially acceptable manner. His favorite drink is a vodka tonic. Hey, uh, you know Steve McQueen’s holding his buddy in his hand in that picture, right? Thanks for the heads up Eric. I’ve seen that picture a bunch of times and never even noticed. Dammit, McQueen! Compared to women, men need usually some more time to get used to new fashion items. 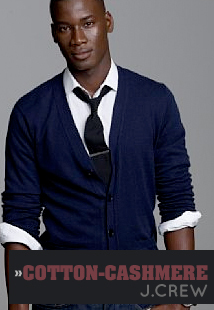 But cardigan is something that looks nice on most of the guys, so it shouldn’t be a garment to be afraid of, but the one to wear with pride instead.